Read what other party organizers and hosts have to say about the psychic entertainment they received. Thank you so much for organizing Autumn. The feed back was positive from our guests. The bride thought she did a fabulous job and was very accurate on many details. Everyone was very happy with their reading and felt that Autumn was true and authentic. She is very talented at what she does. Guest were amazed at some of the things she knew. Please extend my thanks to her for a wonderful evening. Diane was wonderful … we just should have had her for a longer time as she was very popular with our guests. Diane was also flexible in meeting my request for a mix of “seated” and “strolling” readings. “Thank you for the short notice availability. I appreciate it.” — Trish, Wedding Reception (The organizer’s psychic entertainment (from another company) canceled an hour before the reception was to begin. 3 of Cups came to the rescue and supplied two readers who started no more than ten minutes after the canceled entertainers were supposed to begin!! I want to thank you both for sending me such an amazing reader. Autumn was a wonderful addition to my event. My guests and I really enjoyed our readings and we are still talking about Autumn’s comments and incredible ability to pick up on current issues in each of our lives and to offer practical advice and encouragement. We all left our readings feeling energized and positive about the future and feeling better for having learned a little something more about ourselves. We are planning to book Autumn for a second party six months from now to see how our paths have changed in the next six months and if the same issues remain or if we will have an entirely different reading. 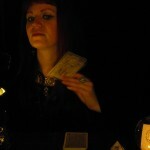 I would strongly recommend Autumn to anyone considering hiring a psychic for their event. Not only are her readings amazingly accurate but she is extremely kind and professional. Thank you so much to you all for making my night such a success. Very best,Caroline — Girls Night In. Tanya was very thorough in her approach to reading my palm and made sure to look at all of the things that were presented to her. She spoke confidently and her insights were wonderful. 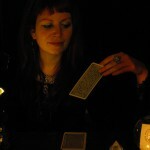 Valerie has a calm and insightful demenor and understood the nuances of the Tarot cards very well. She was bang on in her reading and even sensitive to what I was thinking and feeling. I would highly recommend both of these lovely ladies to any events.” — Allison M, 12 Birthday Parties!! Thanks for a truly fun event. I am getting rave reviews. You were all [Ryan, Marianne, Abella] fantastic. I wish I could have spent more time with you.